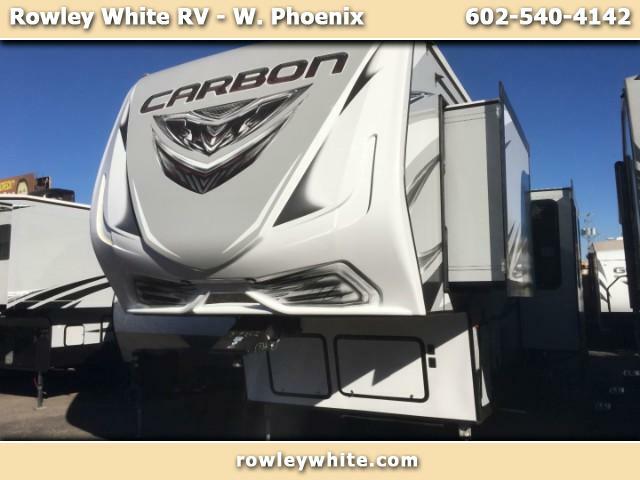 Rowley White RV carries all types of toyhaulers and 5th wheels giving you more to choose from, including this new 387 Carbon from Keystone RV. This trailer has a large garage with plenty of room for the toys and patio kit. Visit Rowleywhite.com to see our full inventory of new and used toyhaulers. Open Monday - Friday 9 - 6, Saturday 9-4 and closed on Sundays. We deal with multiple banks to try and get you the best rates. We also work with banks who specialize in helping people rebuild their credit. Apply online or come fill out an application in person. If you are looking for any Attitude, Stellar, Iconic, Genesis, Powerlite or Stealth model toy haulers or travel trailers make sure you stop by - we will have what you are looking for. We give a free battery, 2 full propane tanks and an RV starter kit with every trailer. Don't forget to ask about our fees, we don't have any. Message: Thought you might be interested in this 2018 Keystone RV Carbon. Welcome To Rowley White RV! We are Toy Hauler Specialist, we don't just sell toy haulers, we are owners and users of toy haulers. We carry the best available brands and offer them at the lowest prices! We are worth the drive from any where in Arizona, with 3 convenient locations at 8102 E Main St in Mesa, AZ 85207, 2825 W McDowell Rd in Phoenix, AZ 85009 and 9665 N Cave Creek Rd in Phoenix, AZ 85020.